We like to make the distinction between the steering columns and the steering shafts because of the different stock set ups used throughout the years. Many components are interchangeable and many are not. So it's good to know what the Bronco came with from the factory. The following is a brief description of the factory steering shafts. 66-75 Manual Steering Shafts were one piece from the steering wheel down to the steering box coupler. The coupler is bell shaped with a boot over the section that connects to the shaft to keep water, dirt, etc. out of the coupler. The coupler is 3/4"-36 spline at the box. The shaft is 3/4" diameter. It rides on the upper and lower column bearings. There is a clamp, our part #2799, that pushes the washer #2665 and sleeve #2650 into the lower column bearing to center the shaft in the column. For 74-75 this clamp pushes against the #2689 column bearing. 73-75 Power Steering Shafts were two piece design. From the steering wheel to a few inches outside the column is the upper shaft. On the end of the upper shaft is a steel flange for bolting up the rag joint. The steel flange is removable with a puller but should only be removed if you intend to do some custom work. When the flange is removed you will see 3/4"-36 splines. 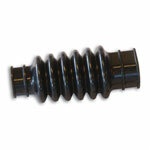 This is really convenient for custom lower shaft installation. At the top of the lower shaft you have a bolt-on rag joint. When you remove it you will find 3/4"-36 splines. The lower shaft is solid right down to the universal joint and yoke. 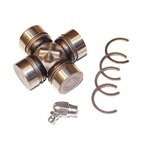 The part of the yoke that installs on the box is 13/16"-36 spline. 76-77 All Upper Shafts are from the steering wheel down to an inch or so outside the column. The rag joint is bolted to the end of this upper shaft. The rag joint and shaft are 3/4"-36 spline. This is really convenient for custom lower shaft installation. The shaft is held in place by a snap ring and c-clip at the top of the shaft. 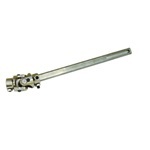 76-77 Lower Manual Steering Shafts are a two piece slip and collapsible design. At the top of the shaft is a steel flange which bolts to the rag joint. 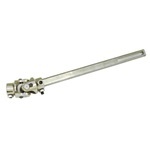 The lower end is a solid 3/4" double D shaft with the u-joint and yoke assembly at the end. At the box the yoke is 3/4"-36 spline like all manual steering early Broncos. 76-77 Lower Power Steering Shafts are the same as the manual with the exception of 13/16"-36 spline to install on the Bronco Saginaw power steering box. We build each of these shafts to order. Every custom shaft has two billet universal joints, one at each end. Our shafts are zinc plated for good looks and corrosion resistance.The special double D shaft is collapsible and expandable. We machine a lube and spring groove into the shaft to provide lifetime lubrication. A dampening spring is added to provide tension between the tube and shaft just like the factory 76-77 collapsible shafts. 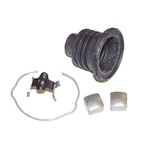 All shafts come with a rubber dust boot to keep out contaminants. WH has solved countless steering issues and we build in excess of 50 different lower shafts for all the different combinations that have come our way. 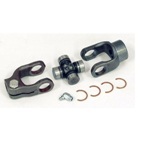 These shafts are an excellent way to solve steering shaft angle problems that can result from body lift installations. 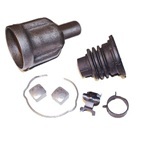 For manual steering equipped Broncos (66-75) drilling and tapping your existing upper shaft will be necessary for installation. For 73-77 Broncos with a two-piece steering shaft, this will completely replace the lower shaft and it is basically a bolt-in installation. Talk to someone on our sales team and they will walk you through a series of questions designed to get you exactly what you need.